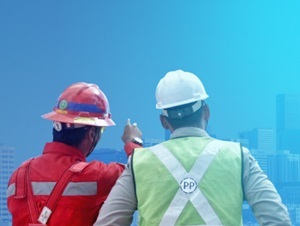 PT Pembangunan Perumahan (Persero) Tbk – PTPP or known as PT PP (Persero) Tbk is one of the largest Indonesian state-owned general construction firms. Established in 1953, PT PP (Persero) Tbk has grown for 65 years in Indonesia one of the largest general contractors in Indonesia in developing prestigious buildings, infrastructure, property and EPC. PT PP (Persero) Tbk has become one of the main players in national construction business. PT PP (Persero) Tbk is a public-listed company which is majority owned by the Government of Indonesia.PT PP (Persero) Tbk is listed on the Indonesia Stock Exchange (IDX) since 2010 under reference code PTPP. As today, the Government of Indonesia holds 51% shares in PT PP (Persero) Tbk. Other 0.08% remaining shares was owned by employees and employees cooperative and 48.92% by general shareholders. PT PP (Persero) Tbk is based in Jakarta and now has 5 divisions; operation divisions I, operation division II, operation division III, operation division IV and EPC division. PTPP also supported by 9 domestic branch offices spread across Indonesia. PT PP (Persero) Tbk’s head office is located at Plaza PP – Wisma Subiyanto, Jl TB Simatupang 57, Pasar Rebo Jakarta Timur 13760. As of December 2017, PT PP (Persero) Tbk has 7 directly-owned subsidiaries; PT PP Properti Tbk, PT PP Presisi Tbk, PP Energi, PP Infrastruktur, PP Urban, PT Metro Kapsul Bandung and PT Sinergi Colomadu.